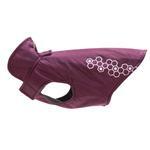 Keep your pooch warm and dry with this lightweight Venture Outerwear Dog Coat in Grapes! The Venture Outerwear Dog Coat has wonderful features for the cooler weather. Waterproof ripstop shell. Cozy lightweight fleece liner. 3M reflective screen in honeycomb pattern maximizes nighttime visibility. Integrated leash access built right into the collar. Back darts for contoured fit. New T-shaped chest panel allows for greater adjustability. It's easy to put on too and attaches at the neck and down the belly with a touch fastener closure. Machine washable. Posted On 03/06/18 by Amy from southern California, CA Yes, Amy recommends this product! In person, this color is more lovely and vibrant than shown on my monitor. The jacket also appears well made, with good design and pleasing materials. Unfortunately for us, it was not a good fit. I purchased the size 30 for my 88 pound American Bulldog, whose measurements are chest 39", length 26", and neck 24". The website suggests that the product's size 30 measurements are chest 33-41", length/back 30", and neck 25-28". On my pup, both sets of velcro fasteners barely closed, meaning that the ends of the velcro barely touched when fitted around my pup. If the fabric pieces with the velcro were longer, the jacket would have worked, but the lengths were too skimpy for this to be viable. Nevertheless, I am rating it 4 out of 5 stars, because it's an excellent jacket if you can get it to fit. Posted On 09/01/16 by Christine S from , OH Yes, Christine S recommends this product!